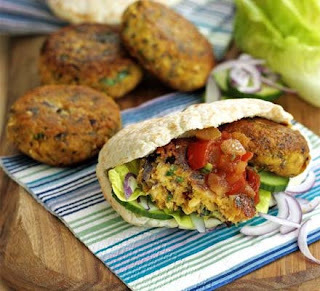 These tiny little burgers are again small enough to pop into a lunch box with a G/F pitta bread and a small tub of dip or even just left plain. The best thing of all is that they're naturally gluten free! Hooray! They're also cheap, and the mixture makes plenty that can be frozen for the future. Double Hooray! Should you want a dip to accompany your fabulous falafel's I've listed a few quick to whip up dips and the like at the end of the recipe, good to you aren't i? *If you wanted you could add some chopped red pepper, carrot, or spring onions, pop them in with everything else at the start of the recipe. Some people like to add breadcrumbs to the mixture, but I find they tend to make the falafel's burn when fried, but if you want to try them with breadcrumbs add 2 tbsp of G/F breadcrumbs to the mix, either make your own by whizzing two slices of bread in the food processor or buy ready made breadcrumbs, Mrs Crimbles do a hefty sized pack for under £2. Pop your chickpeas, onion, garlic and spices into a blender, season with a bit of salt and pepper and pulse until the mixture is a smooth paste that will hold its shape. Shape the mixture into walnut sized balls and flatten with your palm to make them resemble incy wincy burgers. Heat your oil in large frying pan (around 1/4 inch of oil), test the oil to see if its hot by dipping a little bit of the mixture into the oil, it should sizzle. Be careful, they will spit! Fry until golden (not black!) and leave them to drain of a plate covered with kitchen paper to soak up all the nasty excess oil. Eat while they're still warm or when they're cool, they will keep in a sealed box in the fridge for 2-3 days, and can always be popped in the freezer to eat at a later date. Mango and Mint Yogurt Dip : 1 Small can of sliced mangoes or half of one fresh ripe mango, 2 tbsp's fresh mint finely chopped, 200ml plain natural yogurt. Pop in a food mixer until well Incorporated and then spoon into a bowl serve or cover and put in the fridge until you need it. Guacamole: 1 Ripe avocado, 1 tomato finely chopped, 3 spring onions finely chopped, squeeze of lemon, 1tbsp fresh coriander chopped, salt and pepper. Mash the avocado up in a bowl with the back of a fork, then add the other ingredients and mix until all combined, serve or cover and pop in the fridge until you need it. Garlic and Coconut Dip : 5 Cloves of garlic, 5oz grated coconut, 1/4 pint of natural yogurt, tsp mild chili powder. Pound the garlic with a pinch of salt, gradually adding the coconut and then the chili to make a paste. Stir the yogurt into the paste and serve or cover and pop in the fridge until you need it. Tzatziki : Half a cucumber diced, 4 spring onions finely chopped, 1 garlic clove crushed, 200ml Greek yogurt, 3 tbsp chopped mint. Pour the yogurt into a bowl and add all the ingredients, plus a pinch of salt and pepper and mix through, serve or cover and pop in the fridge until you need it. Sadly, again I have no photo for you, take pleasure in the one that I pilfered from the BBC food website.